Looking for the best penny stock to buy is like cruising the casino floor looking for the hottest table to pace your bets on. 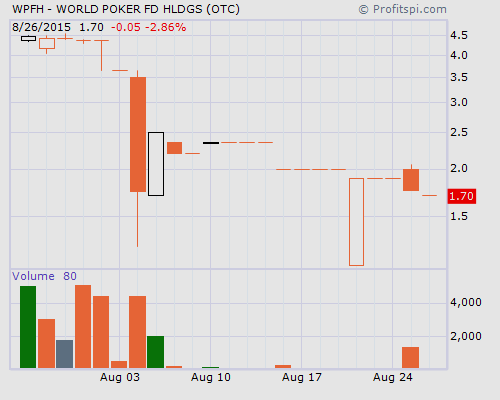 World Poker Fund Holdings Inc. (OTC PINK: WPFH) is likely to soon to get traders betting after a $4,000 gamble was provided to StockPicksNYC, via a third party, that hasn’t seemed to be working out so well at present. With some A-list celebrities reported to be 10% shareholders of WPFH stock, the low float and shinny website could be a place where some begin to place their bets when word about it properly gets out. Searching for penny stocks to buy now? Check out DDAmanda, where traders go to find hot penny stocks to buy! At the end of June, World Poker Fund Holdings announced that it had hooked up via joint venture with LOOKHU, a new streaming media platform. The deal allowed for the Company to begin pre-production of a new poker show called Poker Boss, a show described to be a mafia inspired reality show that combines celebrities, poker pros and everyday players from the street. From the sounds of it, it could be a hit series when you compare it to the stuff on television these days. That list is an exceptional group which has the social media power to make a big influence on WPFH stock. With just $750 in the bank as of June 30, 2015 and no revenues yet to be booked, it’s going to take a serious funding campaign to get some money coming in, especially since the $4,000 paid to StockPicksNYC seems to be having no effect whatsoever. There is debt on the books to consider, $408,276, but at this point, it appears to be a negligible amount. The focus will be better spent to see how the deal announced on July 10 with Vegas Media Group, Inc works out. The agreement, in exchange for 150,000 restricted shares of WPFH stock and $15,000, was for to acquire the tournament and show rights for International Poker League and 20 episodes of successful tournaments which are due to be broadcast on Lookhu.com. We are 100% Anti-Spam and will never rent or sell your information. Many of our picks go up 100%, 200%, even 10,000%, see for yourself. Last updated by Timothy Richards at September 7, 2015 .